In 2004, HSC in association with the Kenilworth Library added the community to our various touring schedules. The company kicked off their inagurral performance at the Kenilworth Library with Shakespeare's Valentiens,, a holiday showcase featuring many of Shakespeare's famous couples examining various themes of love. 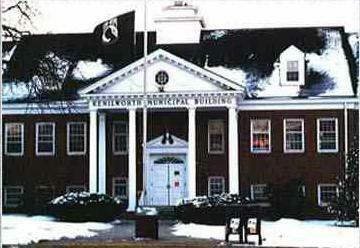 The Borough Hall green (pictured above), with its central location on at 567 Kenilworth Boulevard, or as it is known in the area as "the Boulevard" has become our main outdoor show venue. To view shows performed at Borough Hall and Kenilworth, click on the following titles. A Midsummer Night's Dream, Coriolanus, Lysistrata, Cymbeline. FROM GARDEN STATE PARKWAY NORTH: Take the exit number 138- toward KENILWORTH/ ELIZABETH. Turn SLIGHT LEFT to take the ramp toward KENILWORTH. Turn LEFT onto KENILWORTH BLVD. Parking is available on Kenilworth BLVD or surrounding side streets. FROM GARDEN STATE PARKWAY SOUTH: Take exit number 138- toward KENILWORTH/ ROSELLE PARK. Turn LEFT to take the ramp toward PARKWAY/ KENILWORTH. Turn LEFT onto GALLOPING HILL RD Continue to follow KENILWORTH BLVD. Parking is available on Kenilworth BLVD or surrounding side streets. FROM NYC AREA/LINCOLN TUNNEL: Take RT. 3 WEST to GARDEN STATE PARKWAY SOUTH to exit number 138- toward KENILWORTH/ ROSELLE PARK. Turn LEFT to take the ramp toward PARKWAY/ KENILWORTH. Turn LEFT onto GALLOPING HILL RD Continue to follow KENILWORTH BLVD. Parking is available on Kenilworth BLVD or surrounding side streets. FROM NYC AREA HOLLAND TUNNEL: Take the NJ TURNPIKE BAY EXTENSION to RT. 78 WEST LOCAL and then take the GARDEN STATE PARKWAY SOUTH to exit number 138- toward KENILWORTH/ ROSELLE PARK. Turn LEFT to take the ramp toward PARKWAY/ KENILWORTH. Turn LEFT onto GALLOPING HILL RD Continue to follow KENILWORTH BLVD. Parking is available on Kenilworth BLVD or surrounding side streets.